Researchers have gained new understanding about the chemistry of lithium ion batteries. Researchers at Vanderbilt University have gained new insight into the nanoscale workings of Lithium Ion batteries, a discovery that could speed the development of batteries that can be recharged in seconds. The team of scientists spent the last 7 months investigating batteries containing quantum dots made of iron pyrite, also known as "fool's gold." Quantum dots are particles just a few tens of atoms wide, and researchers already know that their use in batteries allows for very fast charging. But they can also mean a death sentence for the battery. "When the particles get very small, they begin to chemically react with the electrolytes and so the battery can only charge and discharge a few times," said Cary Pint, an assistant professor of mechanical engineering at Vanderbilt. 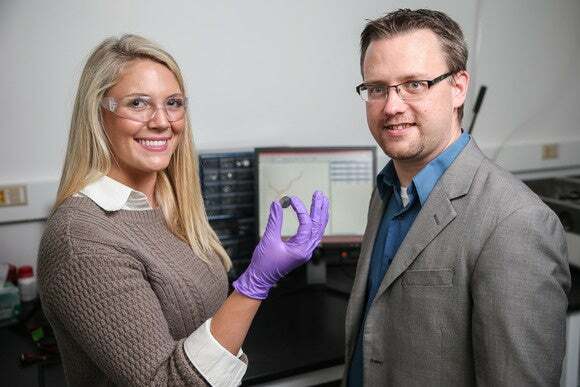 Anna Douglas and Cary Pint with one of the batteries she has modified by adding millions of quantum dots made from iron pyrite. However, the team discovered that when using iron pyrite quantum dots, the battery stores energy in a fundamentally different way, and the same chemical reaction doesn't occur. The work was led by graduate student Anna Douglas. In a conventional lithium ion battery, the lithium ions enter a storage material during charging and leave during discharge. When lithium ions enter the prototype battery they react with the iron pyrite molecules -- which are comprised of one iron atom and two sulfur atoms -- to form lithium sulphur, and the iron atom moves out. On discharge, the reverse happens and the iron pyrite is reformed. "It reverses over and over again," said Pint. 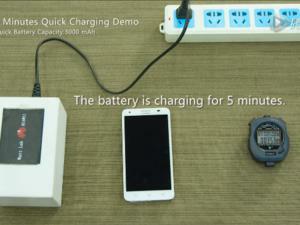 "In this case, that method of storage gives you more capacity and more energy stores. 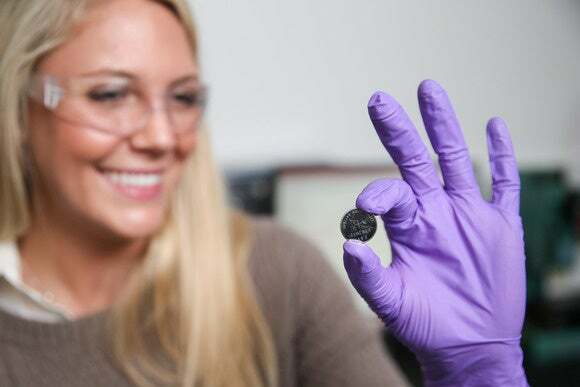 It's a much more exciting mode of energy storage, but you have to have your particle size on a scale that the iron can exit the material." Thus the use of quantum dots. Those used are so small -- about 4.5 nanometers across -- that each experimental battery contained around 50 million of them. A transmission electron microscope image of a single iron pyrite quantum dot on the left and a graph that shows the size distribution of the fool's gold quantum dots that they added to standard lithium batteries. "What we found is when you take these nanoparticles, you’re not limited to the 'death' mechanism. 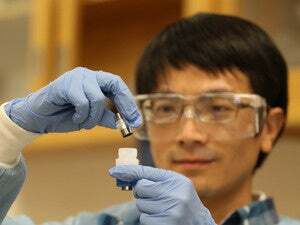 It’s really a sweet spot for integrating small nanoparticles that can charge really fast," he said. While it won't lead to a new type of battery overnight, Pint said the most exciting aspect of the research is the insight it provides into how batteries work on the nanoscale. "This gives us a set of design rules for a family of materials that go through these changes," he said. "We can apply the rules to the whole class of materials and design nanostructure systems that build on these rules. Until now, we didn’t have an understanding of even the basic rules." The work is outlined in the Nov. 11 edition of the ACS Nano journal.